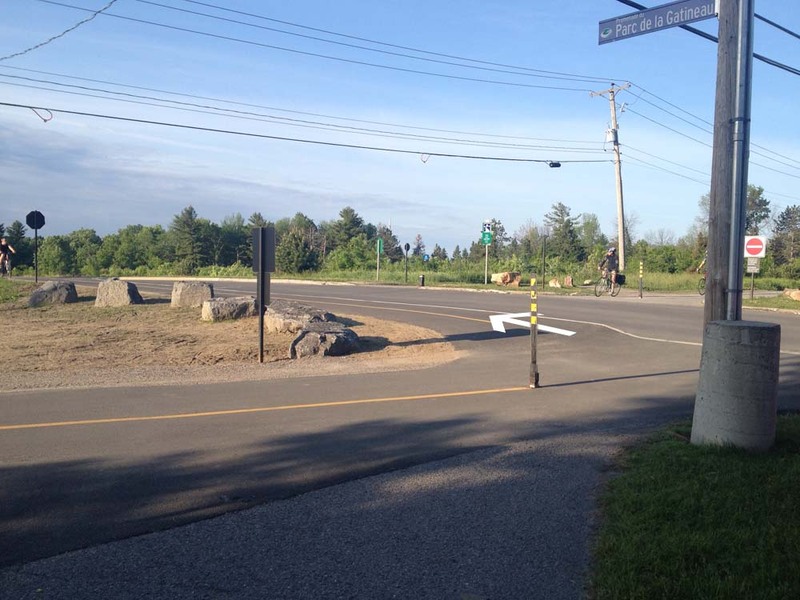 Alexandre wrote, “Just moved into Gattawa from Montreal and biking routes will be a challenge. 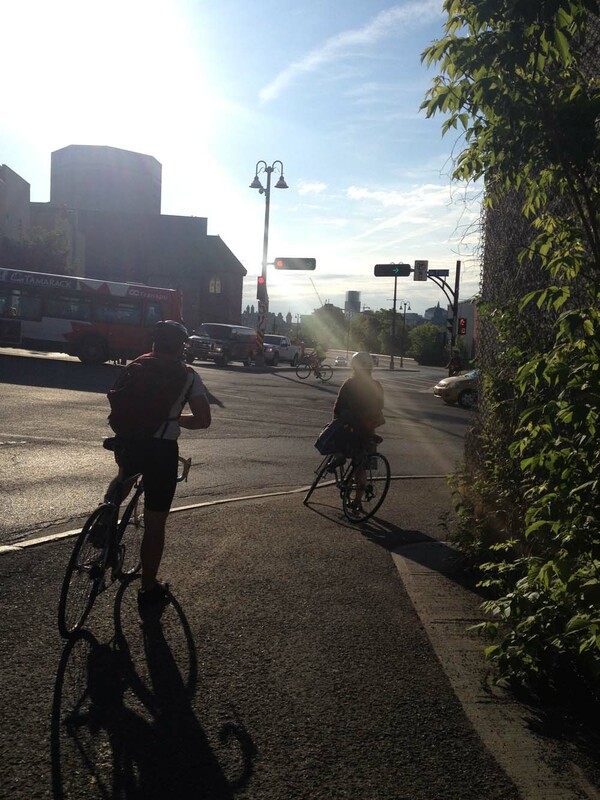 For one thing, what’s the best way to safely bike from Gatineau Park to Ottawa? Or to Aylmer?”. Thanks for asking! 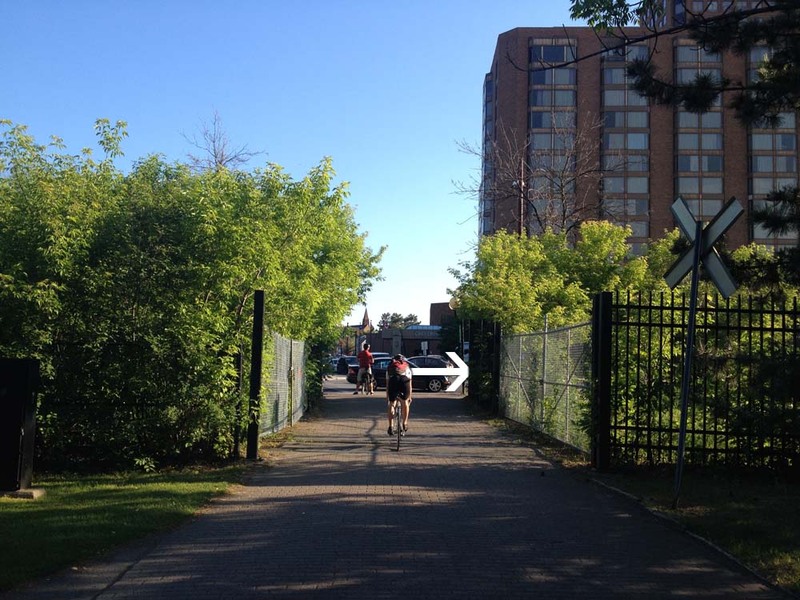 Here’s a safe route from the park to Ottawa. 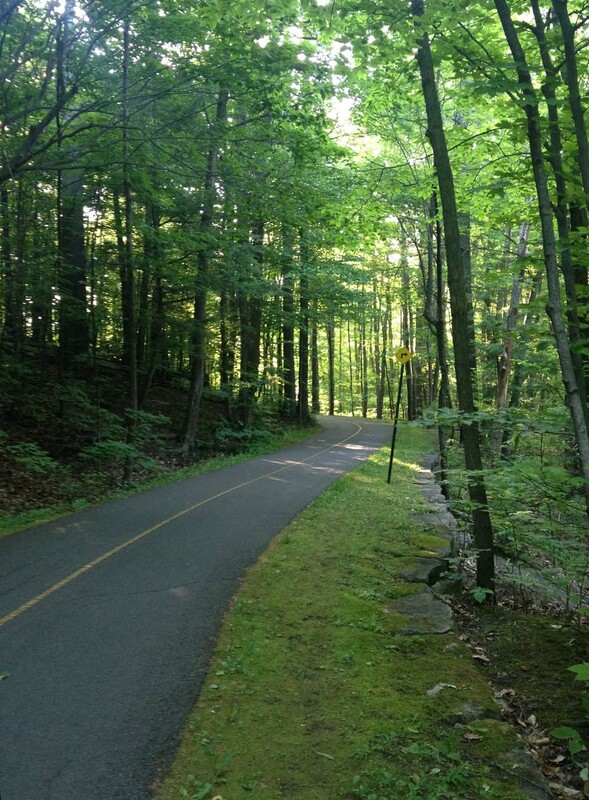 Our adventure begins at the P3 parking lot along the Gatineau Parkway, also referred to as the Gatineau Park Welcome Area. There one can find a big interpretive map panel showing paths that lead into the rest of the park. There is also an interpretive kiosk with helpful information officers. 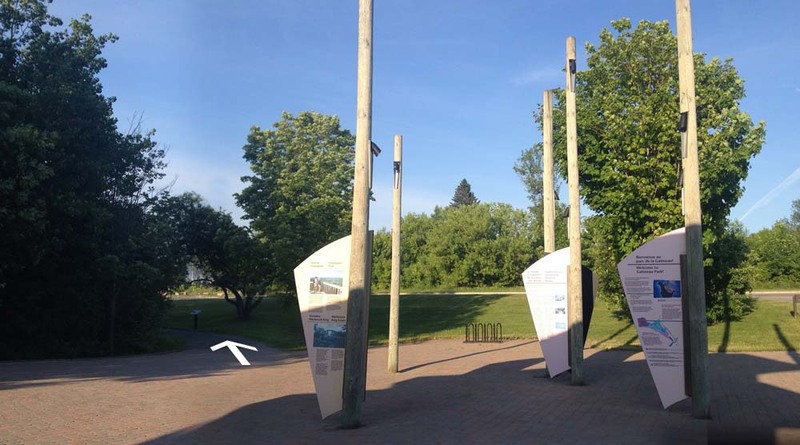 I joined the Gatineau Park Pathway just to the left of these very well designed interpretive panels. 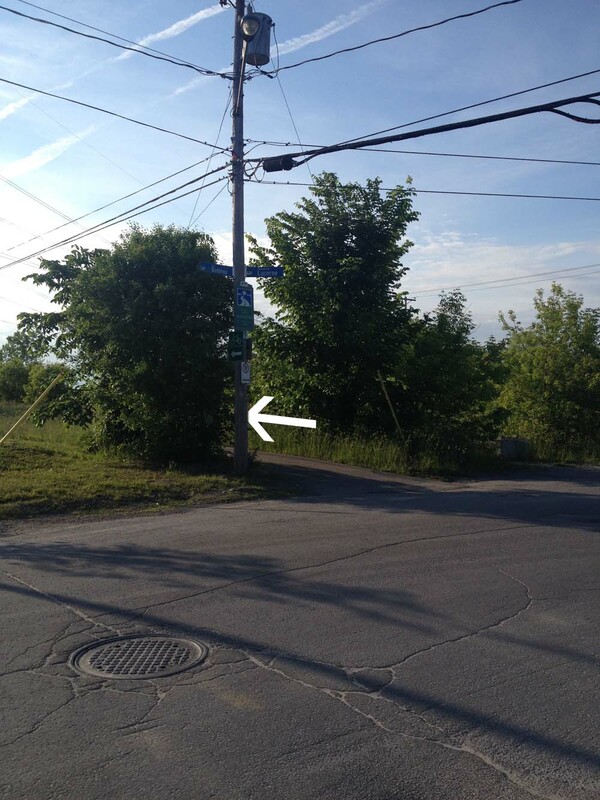 A hundred yards or so further along, the path crosses another path that runs east-west (it used to be Rue Gamelin). I continued south. The path follows the road for a bit before dipping left through a beautiful wooded area. It The path continues alongside the road over Boulevard des Allumetières before heading back through the woods. The path ends at the southernmost tip of the park, at Boulevard Alexandre-Taché. I continued across the intersection down quiet Rue Belleau. At the end of Belleau there’s a path that turns off to the left. A bit further on there’s a fork in the road. This is the Voyageurs Pathway. 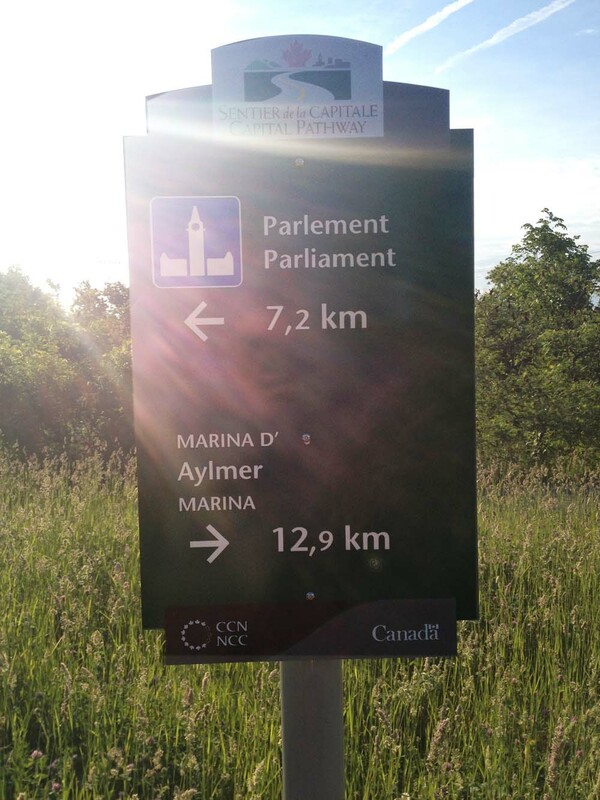 By turning right you’d be heading west, which will take you all the way to Aylmer. It’s a great ride, described in more detail in this post. I turned left and headed towards Ottawa. The path eventually meets up with Boulevard Alexandre Taché once again, just beyond some train tracks, and turns right alongside Boulevard Alexandre Taché. The only spooky bit along this route is at the corner of Boulevard Alexandre-Taché and Rue Eddy. 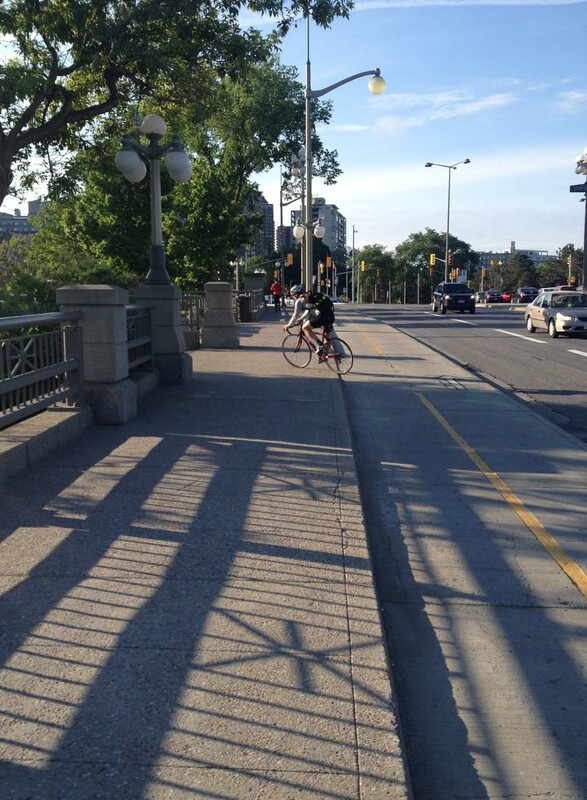 I keep further back and closer to the wall while waiting for the light to change than these fine cyclists ahead of me because I’ve witnessed cars and trucks clip the corner of the sidewalk in their rush to turn onto Eddy and over into Ottawa. I’ve also seen cyclists turn on to Eddy, which I would never have the guts to do as that bridge is very narrow with afore mentioned impatient car & truck drivers. 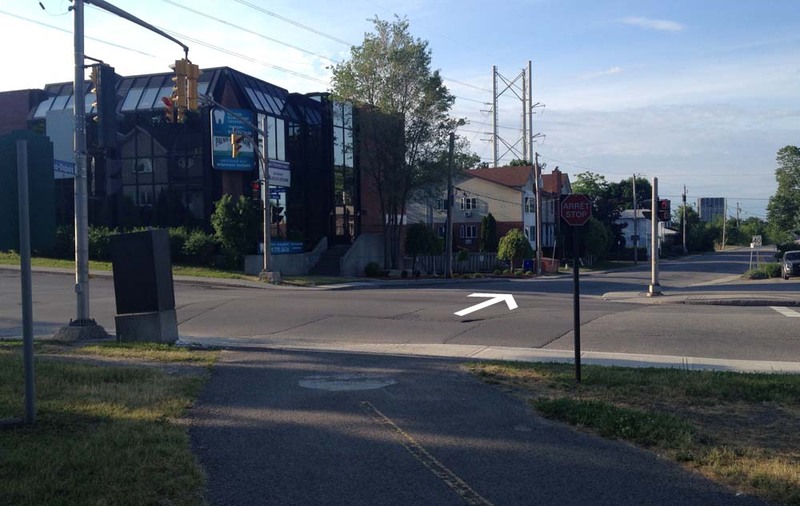 Instead I cross through the intersection and continue along the path on the opposite side. 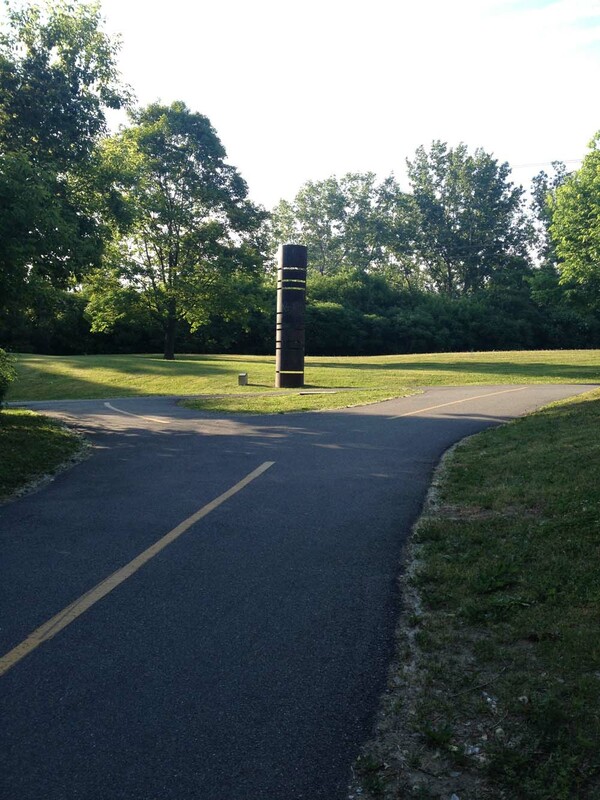 The path continues east, eventually going under the Portage Bridge before popping out in front of this sculpture by Phyllis Kurtz Fine. Turning left takes you behind the Museum of History and the opportunity to cross over to Ottawa on the Alexandra Bridge. 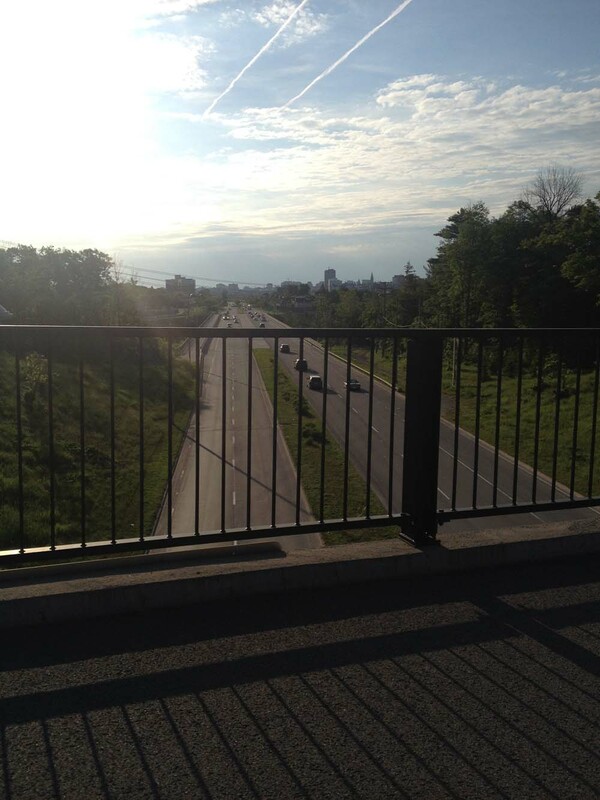 I turned right and made my way along the bike path over the Portage Bridge. Alexandra Bridge towards the left….. Portage Bridge to the right. Once on the other side of the bridge there are a myriad of options, depending on your final destination. I went left, just like this guy, and headed west along the Ottawa River Pathway. Et voila! Will have a lot to say about the challenges of a compulsive pedestrian living in Gattawa. But this post is shows that there’s a lot of benefit to cycling in the region. There sure is! Not perfect yet, but there are lots of great cycling routes around the region. Nelson (see below) also suggested a pretty good Gatineau-Park-to-Ottawa route. Biked from home to downtown and back. This post is exactly what I needed. Sure, it’s fairly straightforward. But this was very reassuring. Hesitated in the same spots and knowing what was ahead helped a lot. Got a bit lost on the way back. Also, it’s not exactly flat. Should get used to it after a while, one would guess. Thanks again for all your help! Where’s the tipjar? Thanks for the suggestion Nelson. Another fine option, particularly if one is heading towards Lowertown.